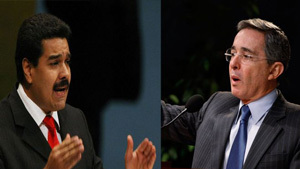 Venezuelan President Nicolas Maduro (left) claims that former Colombian President Alvaro Uribe (right) plotted to kill him. Uribe has said he wants a libel investigation against the Venezuelan leader. He did not provide details. The Venezuelan president, who was elected in April by a narrow margin, earlier this year accused the United States of seeking to kill opposition leader Henrique Capriles to stir chaos and spark a coup. He later said he himself was the target of an assassination plot by mercenaries from El Salvador who had entered Venezuela. The leftist former President Hugo Chavez frequently clashed with Colombia’s Uribe while the two were both in office over issues ranging from border security to free trade agreements and military cooperation with the United States. Chavez died in March after a two-year battle with cancer. Just hours before his death, Maduro alleged “imperialist” conspirators had infected the former president with the disease. Like the late Chavez, Maduro has frequently [accused his opponents or leaders he doesn’t like] of assassination attempts but rarely presented proof or demonstrated who was responsible for them. 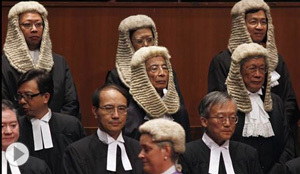 Hong Kong’s lawyers are among the last in the world to wear judicial wigs, those curly, horsehair headpieces that are a legacy of more than 150 years of British colonial rule. The affection is so great that one group of lawyers that doesn’t wear wigs wants the right to don them. The city’s wig-wearers are resisting. The split over wigs mirrors the divide in Hong Kong’s legal profession. As in the U.K. and some former British colonies, Hong Kong’s lawyers are split between solicitors, who work directly with clients, and barristers, who represent those clients in court. The difference has historically been easy to spot: Barristers, like judges, work in an elaborate uniform of robes topped with hand-woven hairpieces. For years, solicitors have been expanding their professional reach into areas traditionally considered barristers’ turf. In 2010, solicitors in Hong Kong gained the right to apply for a special status that would allow them to represent their clients in higher courts. But still, barristers are reluctant to embrace more curly-haired colleagues. The wig-wearing class recently won a victory to protect its roots when Hong Kong’s chief justice denied a request by the city’s solicitors to join its ranks. Solicitors say they are disappointed by the decision, and that not wearing the cauliflower-style tresses makes them vulnerable to discrimination by jury members who might take them less seriously, says solicitor Dieter Yih, president of the Law Society of Hong Kong, an organization that represents the city’s solicitors, which filed the request. “We’re worried that in jury trials there might be a perception that someone wearing a wig is better,” says Mr. Yih. He says solicitors don’t plan to immediately re-petition the chief justice but could if they feel like they are being discriminated against in court. 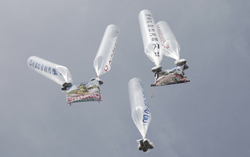 The annual week-long event to raise awareness about North Korea’s human rights violations built to a conclusion on Saturday with the deployment of a weapon that irks Pyongyang most: balloons carrying leaflets with information about the outside world. For the past week, activists at the 10th North Korea Freedom Week hosted seminars, performances, prayer sessions and demonstrations, in order to give more exposure to brutalities inside North Korea. On Saturday morning, activists floated large helium-filled balloons into North Korea from sites close to the border. 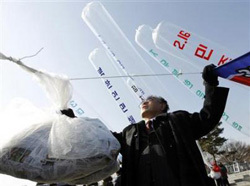 Once the North’s main tool for southbound “psychological warfare” campaigns, the balloons carry information and basic goods across the demilitarized zone. North Korea routinely threatens to attack the launch sites, as it did at the most recent release last month, causing a scare among residents in the border regions. South Korean police said on Friday they planned to try and block the helium canisters from reaching the launch sites on Saturday. North Korea Freedom Week began in 2004 in Washington as a day-long event, the same year as U.S. Congress first passed a North Korean Human Rights Act. In Seoul, where the Freedom Week has been held since 2010, attempts to pass similar legislation in the National Assembly have remained stalled since 2005. But for Park Sun-young, a former lawmaker and one of the few local political advocates of this issue, this year has marked important progress after the landmark resolution in March by the UN Human Rights Council to launch a formal inquiry into North Korean human rights abuses. It is unclear whether momentum will build in South Korea. Previous efforts to bring the issue to mainstream attention were dogged by the left-of-center groups’ opposition, which tend to discourage anything that could create friction with the North. “The North Korean Human Rights Act (in the South Korean parliament) must be adopted and must be written with substance,” said Ms. Park. The leader of the conservative majority Saenuri Party, Hwang Woo-yea, on Monday vowed to pass it during his term. Ms. Park and other activists are also asking the Constitutional Court to rule against South Korea’s inaction, as the constitution considers all Koreans, South and North, equal under the law. This week, Ms. Park also released a list of over one hundred South Korean soldiers and medical doctors taken hostage during the Korean War that she believes are still living inside the North. The Ministry of National Defense’s most recent estimate of surviving South Korean prisoners-of-war is over 500.
b) Like the late President Chavez, President Maduro has frequently accused various leaders or vague people of assassination attempts but rarely presented proof. In addition to making vague accusations of assassination attempts against them, Chavez called President Bush the devil during a speech to the U.N. General Assembly ("The devil came here yesterday," he said, referring to Bush's speech the previous day. "It still smells of sulphur today," he added), and Maduro this weekend called President Obama the "grand chief of devils." Do you think they have some ulterior motive for their accusations, are just trying to get attention, think it will make them more popular with supporters, think it will take the attention away from their poor leadership in governing their own country and the economy, are just delusional? etc.? Explain your answer. b) What is the goal for North Korea Freedom Week? For an issue involving British legal tradition, the decision surprised some. In 2007, solicitors in England and Wales gained the right to wear wigs "in circumstances where they would be worn by members of the Bar." Hong Kong's judiciary office said it didn't think bareheaded lawyers would be viewed in a negative light. A government spokesman said barristers and solicitors are two different professions and should stay dressed as such. Other former British colonies from Barbados to Kenya to India have either completely retired or scaled back use of judicial wigs. Since Hong Kong was handed back to China in 1997, some say the wig has taken on importance as a symbol of an independent judiciary. "It's a tradition that really dignifies our profession, especially in the context of our commitment to uphold the city's justice," says Mr. Tang. The city's attachment to British customs is evident elsewhere, including in court etiquette: Judges are often addressed as "My lord" or "Your ladyship" and other court officials are referred to as "Master" or "Your Worship," though flustered novice barristers have been known to mistakenly use terms such as "My mistress" or even "Your holiness." The barristers' prestige emanates not only from the wig, but because they number in the hundreds, compared with the city's thousands of solicitors. Though solicitors have more training, top barristers are typically better paid and because they appear in court, have higher profiles as well. Even the Cantonese translation for barrister is "big lawyer," while the term for solicitor is simply "lawyer." "Maybe it's also helpful to the profession to wear wigs," says barrister Mr. Lai. "Because I wear a wig, an expensive wig, you have to pay me dearly." Solicitor Geoffrey Booth says he is confident that his own abilities will hold up in court, with or without a horsehair headdress. "I think the job you do is more important," he says. "Someone can be dressed in a wonderful outfit and still be completely hopeless." Occasionally, barristers suffer for the vanity. Two years ago, Mr. Tang recalls a court case that ran until 7 p.m. It was summertime, when temperatures regularly creep above 90 degrees, and after 5:30 p.m., the air-conditioning system automatically turned off. "It was a central cooling system, so there was nothing anyone could do," he says. "Everyone felt really hot, but we still had to keep our wigs on." For a brief period before the judge's ruling, the global legal wig industry was excited by the prospect of its first growth spurt in decades. The industry is tiny; the number of wig-wearing lawyers has steadily declined, while the bewigged rarely buy more than one over the course of a career. Barristers go decades without washing them and will pass them down to younger colleagues upon retirement. A yellowed hue is often prized over the original pearly sheen. "The older it looks, the more experienced you are," Mr. Tang says. Ajay Hira, of local wig maker Legal Tailor, said inquiries from Hong Kong's lawyers jumped 30% before the judge's decision. He employs two wigmakers who work for several weeks on each piece, which can range in style from what he describes as "all frizzy" wigs to others that consist of a series of fat, sausage-roll curls. Wigs sell for HK$5,400, or just under US$700.